Digital Radiography – A Picture Says a Thousand Words! 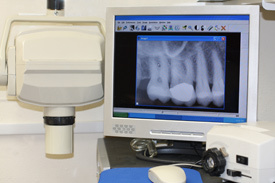 One of the fastest growing areas of modern dentistry is digital radiography. Remember when you had to bite down on those hard-edged cardboard forms that contained the X-ray films? Remember how uncomfortable they were and how you felt that you would gag? A picture says a thousand words. Digital radiography helps you understand what is happening in your mouth. Well, welcome to the 21st century, where many dental practices, including us, have taken the plunge into digital radiography, and we’re sure you’ll love the difference! Digital radiography is a diagnostic tool that provides superior-quality images of your teeth and gums in a matter of seconds. Unlike the X-rays of the past, there is no need for a dark room, or the time it takes to develop the film, to produce a picture of your teeth for the doctor. Digital imaging is a useful diagnostic tool that can be used to explain your dental condition and discuss alternative treatment plans. Because the images are able to be viewed on a computer, we can enlarge the images, zoom in on certain areas and manipulate the images in other ways to best communicate with you so you better understand what the pictures are telling the doctor about you. How are Digital Images Obtained? In order to display digital images on the screen, the dental assistant or technician inserts a small sensor into your mouth and guides it around to different areas. The images are projected almost immediately onto the computer screen so the doctor can evaluate the images to see what is happening in your mouth. What are the Advantages of Using this Technology? Well for one thing, the patient can more easily see and understand what is happening in their mouth. It wasn’t very easy to see things such as tooth decay in the old films, but with the ability to zoom in on specific areas, the patient can fully see and understand their current dental condition. Another major advantage is the time factor involved. Digital images are immediately displayed, whereas X-rays easily added 15-20 minutes to your appointment while you waited for films to be developed. Digital images can easily be sent to insurance companies as part of a claim and can be printed off for the patient to take home. All in all, the doctor, staff and patient are more thoroughly informed with digital images, which makes them a much–needed development in dental technology.